Would you take an Instant Pot to a hotel to make a home-cooked meal instead of room service? What about out in the woods camping instead of hot-dogs-over-the-fire? 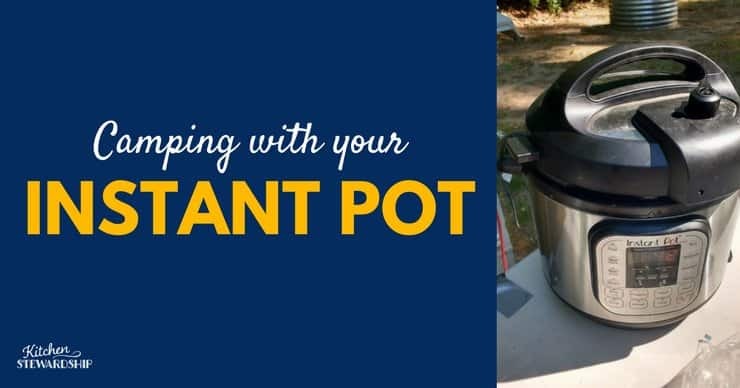 I’m all about both of those options, so let’s talk today about taking an Instant Pot camping and why it’s so easy! This is the 6-quart Instant Pot I started out with. After a few years, we added an 8-quart partly because I knew I would use two at the same time often enough, partly because it was the Prime Day sale, and also because I wanted more space for certain recipes. Both are a pretty basic model and you don’t need more bells and whistles than that! If you’re deciding on size, most people say it’s better to get a deal on the 6-quart and just have 2 rather than go big, BUT if your family has 5 or more people or you really like to batch cook or do more than a pound of beans, the 8-quart may be the best choice. You can even get a carrying case to travel with it! If you really want an old school pressure cooker for the stovetop, you can browse them at Amazon – this is the set that I got for our wedding so very long ago. Mine is actually a 7L size (which is over 7 qts) and the one included here is only a 6-quart. The best thing about these is that they have a glass lid for normal cooking, and they are the two pots we use MOST of all in the last 14 years! So if you have no extra space, just replace a big pot with a pressure cooker and you only need to store the lid additionally. I admit I’m not sure I ever used the pressure function with the smaller pot, but I love both sizes for normal cooking. If I had to do it over, I’d get this set because it has an 8-quart pot and a larger steamer basket that could also do pasta or potatoes. The members of our Kids Cook Real Food eCourse often ask about how to help kids heft a heavy pot of water to the sink to drain, and this is the best solution – pulling out a basket insert rather than lifting boiling liquids around. Find all the Kitchen Stewardship Instant Pot tips and recipes HERE. And before I get too far, let’s address the fact that pressure cooker or not, you NEVER have to succumb to hot-dogs-over-the-fire just because a campfire exists. 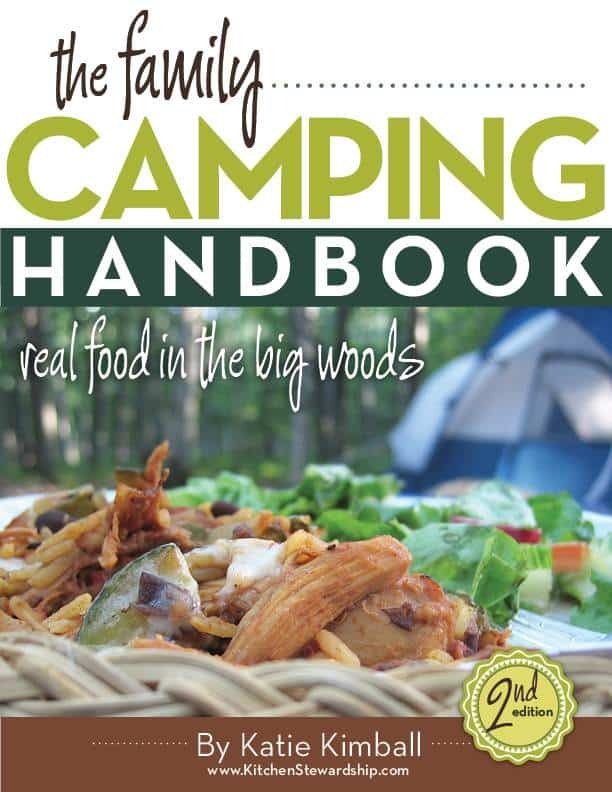 Check out my eBook detailing how to take a 100% real food camping trip (also packed with tips on how to go deep woods camping with young children and enjoy every minute!). GET A FREE PREVIEW SECTION HERE! The worst part about camping is that NOTHING is there when you arrive! You’re generally hungry and ready to relax, but you have to set up camp. With an RV, that can go pretty quickly, but if you’re tenting it like we do – it’s a 2-hour process. The first time I brought my Instant Pot to the campground, I thought it was Heaven, I’m not kidding you. THE smoothest set-up experience EVER! For food safety, I simply froze certain parts of the meal: the meat and the beans in this particular case. As long as you know your drive time, and it’s just a few hours, this should not get to dangerous temperatures. Obviously, use your own discretion and make your own good choices. Plug in the Instant Pot using an extension cord and a provided picnic table, or just on the ground if it’s that kind of camping (love it! ), and turn it on as soon as you arrive. You can now set up camp knowing that dinner will be ready as soon as you are! We were able to get both of our tents set up, everything organized, and even take a walk to the beach before dinner, returning in time to throw some cheese on top, grab some paper plates, and dig in. RELATED: Bethany even lists “travel more” as one of the 5 healthy resolutions the Instant Pot is helping her keep! The first time we took the Instant Pot camping, I wanted something easy, hearty and filling, and preferably a one-pot meal for that Arrival Day Magic. This lentil lasagna (or the Mexican lentils and rice version) was absolutely perfect. I don’t really like leftovers when camping, so I made a half batch. 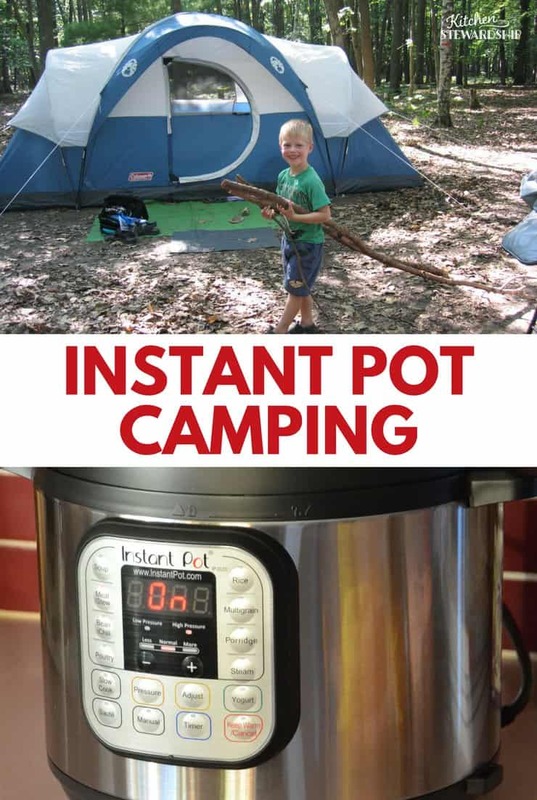 Here are some other Instant Pot camping recipe ideas, but remember that most recipes you already love will probably translate well to The Great Outdoors when you pack your Instant Pot. BBQ Chicken — make potato salad ahead of time as a side and grill some veggies or serve raw with homemade ranch dressing, and your meal is complete! Instant Pot Mac & Cheese – makes a great side dish to burgers on a grill, or bring frozen cooked meat to add to it with some veggies for a one-pot meal! RELATED: Watch my 5-year-old make this recipe and download a free eBook in KID-friendly style including this one and our lentils and rice and BBQ chicken! Imagine how much easier camping will be if the kids are cooking!!! The foil packets described in this frugal real food camping post can be done in an Instant Pot on slow cooker mode, as could any other foil packet meal. (No water is needed on slow cooker mode, but don’t do this using the pressure settings without a tested recipe that includes at least one cup of water and probably a trivet! This one and this one give an idea of timing and there’s a good discussion here on how foil increases cooking time needed, so you may want to try parchment paper instead.) Good backup in case weather prevents a campfire from happening! Country Style Boneless Pork Ribs – same sides as the BBQ chicken is perfect! Check out our healthy camping menu plan (created before I owned an IP) and the gluten-free camping version as well (with my near-disaster pancake mishap!). Because the stainless steel insert comes right out, the Instant Pot really isn’t that hard to clean. You won’t need to do anything more difficult than you would to clean any other pot while out camping. One safety note: it is tempting to put the Instant Pot insert over the fire or on a grill to heat dishwater right in it and wash other dishes, but I recommend bringing a separate pot for that purpose. If the Instant Pot bottom warps at all, it won’t come into contact with the heating plate inside the unit, and you won’t be able to use your appliance anymore. Not something I’m willing to risk! In case of a stubborn spot or perhaps some burned on cheese, I do recommend bringing a scraper like this one and some steel wool… But those are always on my handy camping checklist anyway as you will see in the Family Camping Handbook! I love hearing Instant Pot stories, so spill the beans… Where have you taken your IP lately? I just took mine up to a family summer gathering, and I ended up only using it for rice but it was still worth it because I could be out playing and know that the rice would be ready whenever I needed it — without me having to time things perfectly. I also got the pleasure of grinning from across the room as my uncle, a wonderful cook, peered and poked at it like it was from an alien planet. That’s a great idea. We go camping almost every summer. We use a tent too. We didn’t have an electric site this year so I could not of done this. I do make some stuff ahead of time. Veggie soup, spaghetti sauce, etc and pout them in mason jars. Our first day after we set up I heated up the soup on the camp stove. It was quick and easy. Going to keep this in mind if we ever get an electric site.